Finding elk is not hard, unless you’re looking where the elk aren’t. I realize that sounds a little silly, but the key to finding them is being at the right place at the right time. The right place changes often with elk. The right time rarely changes: early and late in the day. During the rut, noon hunts might prove to be effective, but the first and last hours of daylight are always prime time for elk to be up, moving and feeding. To avoid hunting in the wrong place, even at the “right time”, be diligent about scouting and documenting significant elk evidence for future recall. Seeing elk while actually hunting is most likely to occur in areas where there is very fresh sign, along with recent aging sign. Finding some fresh elk droppings or fresh elk tracks simply means theywere there, perhaps while moving on to a spot a mile or more away. Walk Away From Fresh Sign? 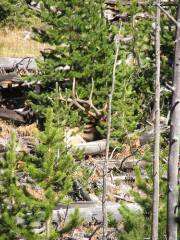 If you are finding recent mixed age elk sign made days, hours and minutes ago, the elk will be back there. Either start carefully "still hunting", or mark the spot in your mind, map and/or GPS. If you're not prepared to still hunt now, and it isn’t prime time, consider leaving the area. Don’t rush a good spot by haphazard, desperate efforts at finding elk right now. Come back at "rush hour", if it is a feeding area. If it is a bedding area and after about 9:00 or 10:00 a.m., it might be best to back out quietly. If you want to hunt bedded elk, try to pinpoint them with cow talk or a locator bugle from a distance. Then quiet down as you approach the area from downwind (no exception), very slowly. Use muted cow talk, if you make too much feet noise. You could just get in close and wait it out. They will begin moving again about 3:00. If you can stay downwind and be in the right place as they move, you might get a shot. If it is archery season, you might should set up and spend some time cow calling, and maybe some very light bugling. But if nothing shows up, consider leaving it relatively unmolested for a later prime time hunt. Don’t “stink up the joint” with human scent by tromping all over the right place at the wrong time. Click here for scent control page. Finding elk often needs to come before hunting elk. If there is a high vista you can get up to and just glass the surrounding area before dark, do it. You might see how they come to that hot spot, or determine if they are currently using it. Watching instead of hunting, especially during archery season, may seem like a waste of time, but it could save you a lot of tiring and discouraging hikes. If they don’t appear to be using the spot, they may have been pushed out by you or other hunters. Finding elk requires planning and patience. If the sign is fresh mixed with recent older sign, finding elk there will happen sooner or later. That doesn’t necessarily warrant hunting it from then on every day until they finally show up, although that might work, if done carefully. Put it down as one of several hunting spots for you to rotate in and out of. If you push them out of there with your repeated scent and presence, they might avoid the area for a while, moving on to some faraway place. Elk keep excellent mental notes of where the current best food, water and safe refuges are. They move around for miles as food sources change and pressure (fear) is experienced. Elk constantly play the shell game with us. Once we think we know where they are hanging out and how they are traveling, suddenly they disappear overnight to somewhere unknown to us. Finding elk is all about hunting several “hot spots”, rotating from one to another, until we are finally there at the right place and at the same time they are. Finding elk successfully is often the result of knowing when not to hunt, when to back away and come back another day. Hunting hard is not always the best approach. Hunt smarter, not harder.